The City of Angels is getting all dolled up over the next decade — the Summer Olympics are coming to L.A. in 2028! For value seekers, though, the time to visit is now, thanks to more places to stay — 9,000 new hotel rooms by the end of 2018 — and more ways to fly here — 10 new domestic routes in the last year. More availability almost always means lower prices. 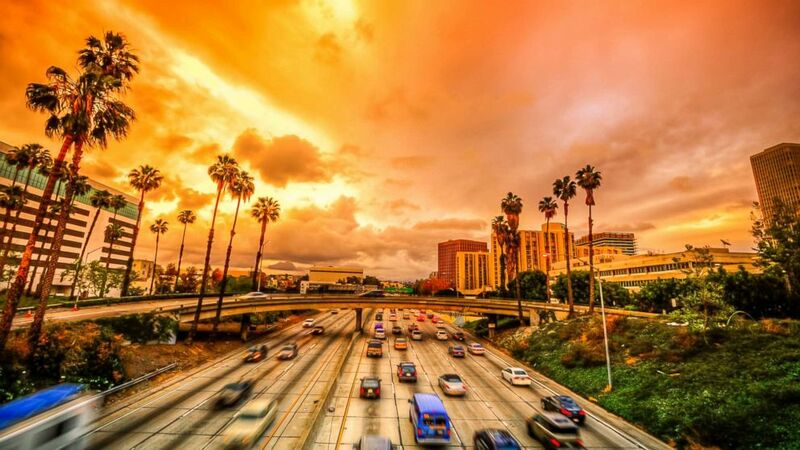 Throw in the fact that what’s world-famous about L.A. hasn’t changed, from its celebrity residents to the perfect weather to an exploding food scene, and an L.A. visit is a no-brainer. Haven’t been in awhile? Here’s more of what makes California’s largest city awesome. A vivid sunset is seen over Venice Beach with Santa Monica Pier in the distance in this undated stock photo. Rodeo Drive in Beverly Hills is a paradise for well-heeled shoppers, but the ritzy storefronts relegate most of us to window shopping. In nearby Venice, Abbot Kinney Boulevard is a mile-long thoroughfare close to the beach that’s quickly become a trendy epicenter for food, fashion and art. Aust features creative wares by Australia’s up-and-coming designers, The Tasting Kitchen draws big brunch crowds, and The Otheroom pours fine wine and beer late into the night. Every month, First Friday brings out dozens of food trucks and shoppers on the hunt for special deals. While he doesn’t completely discount Beverly Hills for celeb spotting, “West Hollywood is better,” says Gregg Gant, business development manager at Travelzoo’s L.A. office. “Check out restaurants like The Ivy on Robertson for a late lunch, and do the Nice Guy for dinner. Get a day pass to Equinox in West Hollywood and work out with stars like Common or Tyler Perry. Check out Catch, the hot new club. Or see a concert at the famous Troubadour, where bands like the Elton John, Kelly Clarkson, Van Morrison, The Eagles & James Taylor have played.” Exploring West Hollywood is easy when you board the WeHo Pickup, a totally free shuttle that runs weekends and does a six-mile loop along Santa Monica Boulevard’s hot clubs, eateries and shops. Malibu is gorgeous, stretching along the Pacific toward the L.A.-Ventura County line. But neighboring Pacific Palisades, my hometown, is an alternative seaside, celeb-laden community. Much smaller and anchored by famous Sunset Boulevard, it’s home to Tinsel Town names like Matt Damon, Steven Spielberg and Goldie Hawn. And special local attractions abound, from the peaceful oasis known as the Lake Shrine to bucolic Will Rogers State Park. Remnants of old coastal infrastructure along the Pacific Palisades coastline in Los Angeles is pictured in this undated stock photo. Celeb-spotting is a favorite L.A. pastime, but don’t forget about the stars above. Griffith Park is open until 10 p.m., making it ideal for a night of hiking and sky watching. The Griffith Observatory — its iconic architecture makes it a regular backdrop in movies, from “The Terminator” to “La La Land” — features public telescopes, planetarium shows and interactive space exhibits. Getting in is free and, at more than 1,100 feet above sea level, the views of the city and even the Hollywood sign are beautiful. Griffith Park spans 4,500 acres, making it L.A.’s largest historical landmark. Some of the best museums in L.A. are free every day. Art buffs flock to the Hammer Museum in Westwood. History buffs love the Getty Villa in Pacific Palisades and the Getty Center in Brentwood (advanced reservation for $15 parking at both locations is a good idea). And kids are always awed by exhibits like the Space Shuttle Endeavour at the California Science Center at Exposition Park. “The Broad museum featuring the Yayoi Kusama exhibit is a must,” adds Sachdev. “This block of L.A. is truly a piece of art. You can visit The Broad for free, catch a show at the iconic Disney Concert Hall or L.A. Phil and have a beautiful meal at Otium, all within a five-minute walking radius.” Many other museums, like the L.A. County Museum of Art, offer free days at least once a month. For a real art party, join DTLA’s all-day Downtown Art Walk the second Thursday of every month. When I grew up in L.A., you avoided downtown. Today, thanks to major investment and concerted planning, downtown is a mecca for those seeking culture, dining and nightlife. “I did a guiding walking tour of downtown L.A., and it was awesome,” says Gant. “I learned so much about the city, its history and its culture.” There are dozens of happy hour hot spots here, like the Whiskey Lounge, Triple 8 China Bar & Grill and Orchid Bar Kitchen. There are plenty of parks and green spaces. And you’ll find famous entertainment venues like L.A. Live and the Staples Center here, too. One of the hottest not-to-be-missed attractions is OUE Skyspace LA on the 71st floor of the U.S. Bank Tower. Interactive educational exhibits about Los Angeles lead you to two large observation terraces that offer breathtaking views, from the San Gabriel Mountains to the Pacific Ocean. Don’t leave without going down the Skyslide, a 45-foot-long outdoor glass slide perched high above the city. The golden age of air travel is alive and well in L.A. The Pan Am Experience is one of the city’s most unique dinner experiences, set inside a restored 1970s Pan Am jumbo jet. The multi-course meal — served in either coach or first class — is gourmet and modeled after actual Pan Am menus. Flight attendants wear vintage Pan Am uniforms. And guests, limited to only about 50, dress to the nines, the way it used to be. The experience is entertaining, energetic and one-of-a-kind. “No details were overlooked,” says Lily Fu, executive producer at Travelzoo LA who’s put together several Travelzoo member-only events here. “Everything down to the recipes, utensils and glassware are from original Pan Am flights. It’s like going to an elegant, retro dinner-theater show. It’s uniquely L.A. and still very much under the radar, but probably not for long!” The Pan Am Experience is located at Air Hollywood, a movie studio in Pacoima where hundreds of movie and TV show airplane scenes have been filmed. It’s tough to avoid renting a car if you want to cover a lot of ground in L.A. So why not fly, instead? L.A. is home to several flight schools, including South Coast Aeronautics at Torrance Municipal Airport. The FAA-certified instructors here use a SOCATA Tobago airplane, featuring a 180-horsepower engine, a three-blade constant speed propeller and deluxe leather interiors. A 70-minute lesson begins with a 20-minute pre-flight briefing on flight fundamentals and includes 50 minutes of flight time. You fly past the Hollywood sign, downtown L.A., Beverly Hills and movie studios. Skyscrapers are pictured in downtown Los Angeles in this undated stock photo. If you’re planning on visiting the happiest place on Earth, consider the train. Board at Amtrak’s historic Union Station downtown and enjoy the traffic-free ride all the way to Anaheim. From ARTIC (the impressive Anaheim Regional Transportation Intermodal Center), Disneyland and California Adventure are about 5 miles away, an easy cab or rideshare ride. No paying for parking! Anchored just 22 miles off the L.A. coastline, Catalina Island is an easy day trip. You can take an express one-hour ferry ride from Long Beach, San Pedro, Newport Beach or Dana Point; paying a little more gets you a quick chopper ride over the water. The main town of Avalon offers leisurely strolls — by foot, bike, golf cart or Segway — as well as eateries and shops. Golf, hiking and a new zip line will appeal to adventurers. And, yes, there are beaches here, too. Catalina enjoys a touch of Hollywood; more than 500 films have been shot here. Gabe Saglie is Senior Editor for Travelzoo, which features exclusive deals to and in L.A. at www.travelzoo.com. Let him know on Twitter or Instagram: @gabesaglie.